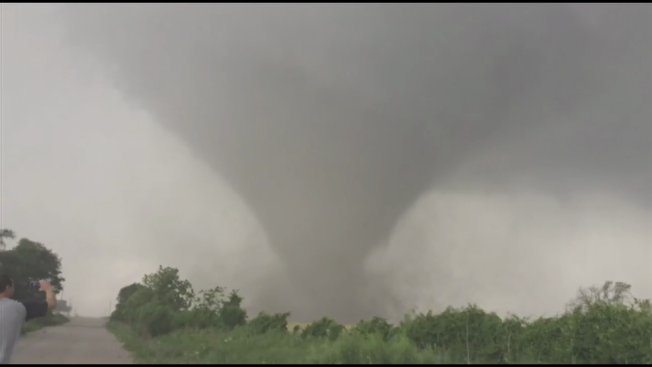 Image from Brian Khoury shows the tornado over Eastland County, Saturday, May 9, 2015. The National Weather Service says a tornado that touched down in Eastland County Saturday was an EF-3 on the Enhanced Fujita scale. Severe EF-3 tornadoes can have wind speeds up to 165 mph. One woman was killed Saturday when a storm destroyed her home in Cisco. A second person inside the home was severely injured. Several other people in the sparsely populated farming and ranching community were unaccounted for Saturday night. Eastland County Judge Rex Fields said Saturday that there was a five-mile trail of destruction south of Cisco caused by the storms. The NWS said more detailed information about the tornado would be forthcoming.